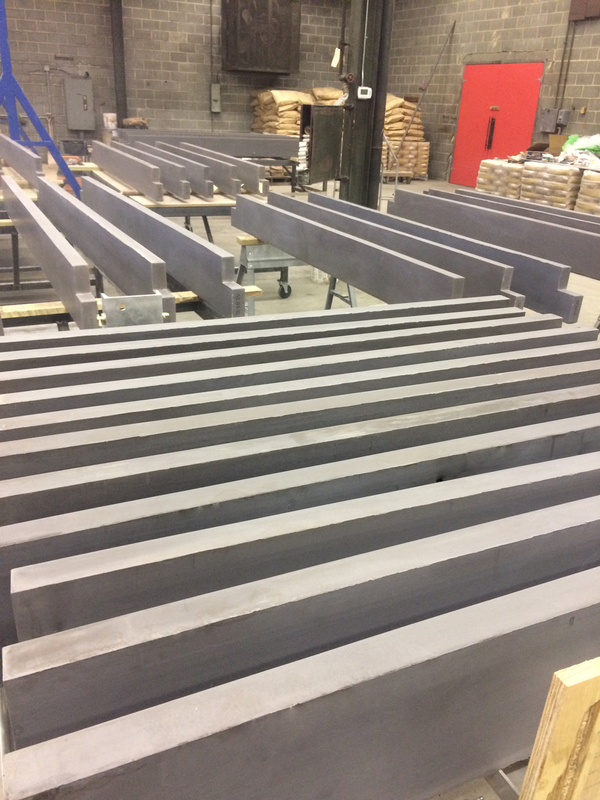 Fine Concrete, LLC is one of a select group of firms in the United States holding a sub-license to design and fabricate with Ductal®, an ULTRA HIGH PERFORMANCE CONCRETE. We have the expertise and years of precedent projects from the LaFarge Holcim Concrete Company, one of the largest concrete manufacturers in the world, and specifically the Ductal® division, the original holders of the three UHPC patents. This innovative material produces concrete elements that are up to 10 times stronger than conventional concrete. The UHPC possesses unprecedented flexural strength, allowing for finer, thinner, lighter and more elegant designs. The chemistry is cutting edge while still embracing the natural qualities of concrete. We have a team of certified UHPC engineers licensed to engineer our designs and systems throughout North America. DUCTAL® is fiber-reinforced and has tensile strength, unlike conventional concrete. It achieves this engineering feat by progressively absorbing the energy applied and efficiently dispersing it throughout the matrix. These mechanical properties make it possible to create very slender structures with little or no passive steel reinforcement. DUCTAL® is ULTRA-HIGH PERFORMANCE, developed and patented by LaFarge International of France. LaFarge is one of the largest manufacturers of cement, concrete and aggregates in the world, employing about 70,000 people. FineConcrete works directly with LaFarge North America in Canada. HIGH STRENGTH Ductal® is a ductile material formulated by combining portland cement, silica fume, quartz flour, fine silica sand, high-range water reducer, water, and steel or organic fibers. LONGEVITY Ductal® is much more durable than conventional concrete. With higher strength concrete, tested at 28,000 PSI, Ductal® withstands abrasion and tough environmental conditions. Conventional concrete has limited strength ratings of 3,500-5,000 PSI, is porous, and lacks tensile strength. DENSITY The largest aggregate in Ductal® is 500 microns, yielding a highly dense material making it resistant to staining with zero water penetration. Ductal® design mixes are chemical and saline resistant, and fire and blast resistant. Conventional concrete is more porous and thereby more susceptible to cracking, staining, and degradation due to freeze/thaw conditions. Because Ductal® is less porous, it offers resistance to scratching and staining. This super fine design matrix also produces a surface capable of intricate detail with unlimited surface textures, finishes and colors. NO INTERNAL STEEL REINFORCING Ductal® has tensile strength and usually does not require internal reinforcement. We cast thinner profiles for lighter pieces, yielding cost savings and environmental benefits, as well as aesthetic design freedom. REFINED FINISH The UHPC surface has a smooth refined finish that is uniform in appearance, and allows for post-cast processes including acid washing, sandblasting, or diamond wet polishing. LARGER PANEL SIZING Due to the inherent strength of Ductal®, larger panels allow for more design options and less jointing of material. Reduced steel substructure and connection points yields substantial cost savings. STRUCTURAL DESIGN MIXES Ductal® can be designed as structural elements integral with the finished surface, eliminating repetitive systems. SUSTAINABILITY Ductal® uses substantially less water than conventional concrete, produces minimal waste in fabrication, and results in longer life expectancy, which allows for LEED credits for the overall project (see below). Without internal steel, elements are easily reclaimed and recycled. The following tables list potential LEED® credits that some Ductal® projects may contribute to, depending on the application. For more detailed LEED® credit information about a specific project, contact a Ductal® representative. The table below indicates the material’s general performance values which are obtained in the test procedures specified in the UHPC recommendations. The values above are for guidance only and cannot be used as technical design specifications. They depend on the product characteristics, experimentation method, raw materials, formulas, manufacturing procedures and equipment used; all of which may vary. This data provides no guarantee or commitment that the values will be achieved in any particular application of Ductal®. Ductal® is a registered trademark and may not be used without permission. The ultra-high performance material that is Ductal® and its various components are protected by various patents and may not be used except pursuant to the terms of a license agreement with the patent holder. Ductal® exhibits excellent performance in compressions: It is 4 to 8 times higher than conventional concretes. Compression behavior is almost linear elastic up to the maximum stress and exhibits no damage to the material during this phase. Stress curve – deformation for a sample of Ductal® with metallic fibers. The shape of the curve is identical for Ductal® with organic fibers although the peak value is lower. Ductal® with metallic fibers contains 2% by volume of metallic fibers, or more than 50 million metallic fibers per cubic meter. The fibers give the material a ductile behavior during bending (i.e., when loaded in flexure behond the elastic limit, micro-cracks occur and the fibers hold the cracks tightly closed, providing a ductile performance rather than a sudden or brittle failure) as shown in the following graph. The ductility behavior observed during bending is characterized by a multiple cracks before the stress peaks, without localization and without the presence of any major cracks. Shrinkage and creep are probably the most remarkable properties of Ductal®. Creep tests have been carried out in France at the Ecole Centrale de Nantes and at the Laboratoire Central des Ponts et Chaussées (LCPC) and in the United States at the Federal Highway Administration (FHWA) Research Center in McLean, Virginia, USA. For ordinary concrete, the creep coefficient can reach 3-4; for high-performance concrete, this is reduced but the recorded deformation remains higher than the elastic deformation. The creep coefficient of Ductal® is less than 0.8, and if a heat treatment is applied, the creep factor is less than 0.2, as shown in the figure below. As a rule, a value of 0.3 is considered for calculations. Since the water to cement ratio is very low, Ductal® does not exhibit drying shrinkage. An endogenous shrinkage is observed (300 to 400 μm/m), but when heat treatment is applied, shrinkage is complete by the end of the treatment and there is no subsequent residual shrinkage, as shown in the figure below. Fatigue tests on pre-loaded test samples were carried out at the CSTB. The loading applied was between 10 and 90% of the elastic limit. The figure below shows a crack opening displacement curve in relation to the number of cycles. Note: There is no increase in the crack opening, i.e. no crack propagation, at 1.2 million cycles. Analysis of the rate of increase of the deflection in relation to the number of cycles shows that the loading applied is below the material’s threshold of endurance. When calculating the design of structures subjected to fatigue action-effects, the service stress is limited to the material’s resistance to direct tension. The results presented above verify that the application of the UHPC rule is particularly reliable in the case of Ductal® products with metallic fibers. Ductal® materials are classed as “M0” (non-flammable). A specific formulation, Ductal®-AF has been developed for improved fire resistance. This formulation uses metallic fibers, to which organic fibers are added. ISO 834 fire-resistance tests on loaded and non-loaded columns and beams have been carried out at the Centre Scientifique et Technique du Bâtiment (CSTB – Marne-La-Vallée) and at VTT in Finland. These tests have demonstrated the material’s excellent resistance and near total absence of spalling. The photo below shows a column before and after the ISO fire test. The characterization of Ductal® at high temperatures was carried out at CSTB in Grenoble, at SFC in France, at the University of Braunschweig in Germany, at the Politecnico di Milano in Italy, and at Imperial College London in the UK. A summary of the results is given below. 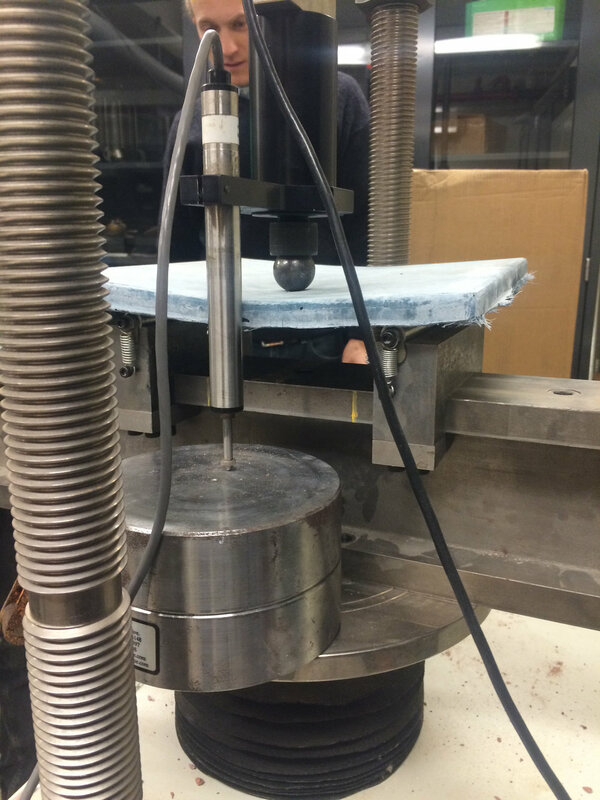 Compressive tests at high temperatures were carried out on test samples of Ductal®. Some of the tests were carried out on samples after cooling having been maintained at a given temperature T: so-called ‘residual’ tests. Some of the test samples were tested at the constant temperature T: so-called ‘hot’ tests.The figure below shows all the results. We can see that the results obtained are almost all higher than the “DTU Feu” (French fire safety standard) curve specified for HPCs (extension of the “DTU Feu” for HPCs between 60 and 80 MPa).This standard DTU curve can therefore be used for calculating the fire resistance of structures in Ductal®.